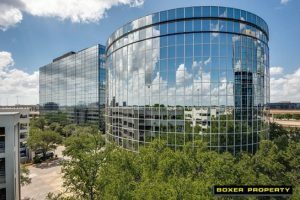 October 31, 2017 (DALLAS, TX) – Boxer Property, a Houston-based commercial real estate firm, is pleased to announce it has concluded lease negotiations with Arizona College for 24,065 square feet of office space at 8330 Lyndon B. Johnson Fwy in Dallas, TX. Alexander Renwick, negotiated the lease on behalf of Boxer Property. Jeff Woolf, MCR and Jerry Cobb, Jr. of CBRE represented the tenant. 8330-8360 Lyndon B. Johnson Fwy features a total of 381,383 square feet of office space for rent. These Class A buildings consist of 12 and 10 stories respectively, with a myriad of modern amenities such as mirrored exterior windows, free controlled access garage parking, on-site fitness center, conference rooms, an 85-seat auditorium with stadium style seating, FedEx and UPS drop boxes, 24-hour on-site security, and on-site maintenance and management services. The property is conveniently located near the DART’s LBJ/Central Station with many dining options within the vicinity including Starbucks, Outback Steakhouse, Asian Mint and Benihana. With campuses in Glendale, AZ, Mesa, AZ, and Las Vegas, NV, Arizona College provides students an exceptional education in professional nursing and offers a wide variety of other in-demand health science programs. Arizona College offers a structured and disciplined educational environment to help all students reach their potential as the health professionals of tomorrow. The Bachelor of Nursing Science at Arizona College-Mesa Campus is accredited by the Commission on Collegiate Nursing Education (CCNE). The Bachelor of Nursing Science at Arizona College-Las Vegas Campus is pursuing initial accreditation by CCNE. Applying for accreditation does not guarantee that accreditation will be granted. For more information, visit arizonacollege.edu.